Start with strategies that you can implement without causing major revolt in your family, moving gradually to a goal of a lower budget for food that is healthy, wholesome and homemade! If I have left some out, please email me with your hints and tips, I would be happy to include them here! Note: I have tried to arrange these in order from least difficult to most difficult. I hope they make sense! 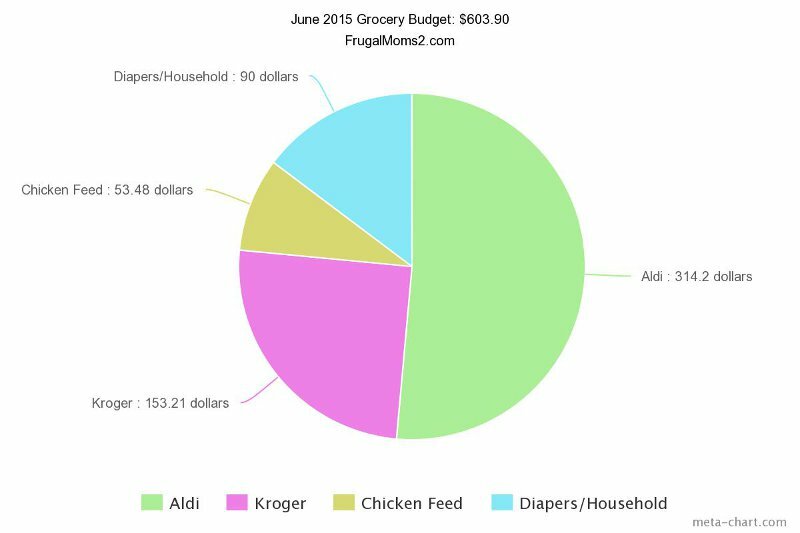 This way, you can see the changes along the way and be willing to make more frugal choices as you and your family gets more comfortable with this way of eating and shopping! Start with a few things and keep adding, soon you will see a HUGE difference in your food budget! 2. Use Everything– when you are cooking, think about how you can get every last food mile out of what you are making. Meat bones and vegetable trimmings can be made into wonderful stocks. Leftover vegetables and meats can be thrown into the sam estock for free soups and stews or put into pot pies, homemade “hot pockets”, crepes, casseroles, you name it! Look at food waste in an entirely new light, try to get every thing out of your food dollar! 3. The Price Book– This is the most useful tool in making sure that every food dollar you spend is spent well! The basic idea of the price book is to have a system for tracking prices so that when you see something on sale, you will know whether it is really a good buy or not. I have included a detailed page on the price book here: price book. I use a three ring binder and looseleaf paper. At the top of each page, I put several column headings: Date, Store, Item, Size, Price, Unit Price, Sale. At the top right hand corner of the paper, I put the name of the item (such as “bread”, “milk”, “cereal”, etc). When I see a sale or even a regular price, I write it down in the price book. It is easier to do this at home with store receipts or sale ads, instead of in the store, where some employees may mistake you for a competitor’s spy! It does happen! After a few months of tracking prices, you will know what is a good deal and what is not. The most important section of the price book is the unit price, because that tells you, no matter what size the item, how much you are actually paying per pound or ounce or other unit of something. 4. Bulk Buying– With the price book in hand, you will be able to bulk buy with much more confidence! Now when flour goes down to 49 cents for a 5 pound bag, you will know that this is an excellent price and to stock up! Then when it goes back up over a dollar, you’ll still be using the flour that you bought for the lowest price and smiling! Bulk buying can be a little scary at first. Buying so much can be intimidating. How will I use this all? How will I store it? The answer is to get creative! Things that can be kept at room temperature can be stored under beds, in closets, anywhere! This is especially true of canned goods. Flour can be frozen (to prevent weevils) and then stored in airtight containers at room temperature. 5. Use your freezer– Eventually you will want to have a deep freeze to stock up on good deals on meats and other frozen items. A freezer is a great investment and tightwad tool! If you can get an older one cheap, it may be a good deal if it is still efficient (10-15 year old models are ok, but a 30 year old freezer will cost a bundle in energy!) Check out newer, more efficient models and put the word out that you are looking for a freezer. We got our freezer (now 15 years old ) from my husband’s grandmother who found they just didn’t eat enough to justify having a big one anymore. It has served us well and saved us thousands (in the 5 years we have had it) on groceries! 6. Cut down/out on the junk food– If you can get the tribe to completely give up the soda, chips, cookies, candy, etc, good for you! We have been working towards this goal for some time now, and have managed to cut out soda (we still drink kool aid and sun tea), most cake, and alcohol (I consider this to be junk! You have to decide for yourself). We have cut down on baked goods, and I make any we eat from scratch. We still buy chips for lunches only, and enjoy popcorn and homemade pizza on our weekly movie night. 9. 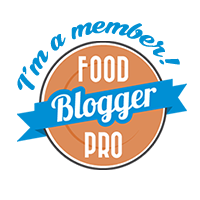 Clone your favorite brand name and restaurant recipes– this is not as hard as it sounds! 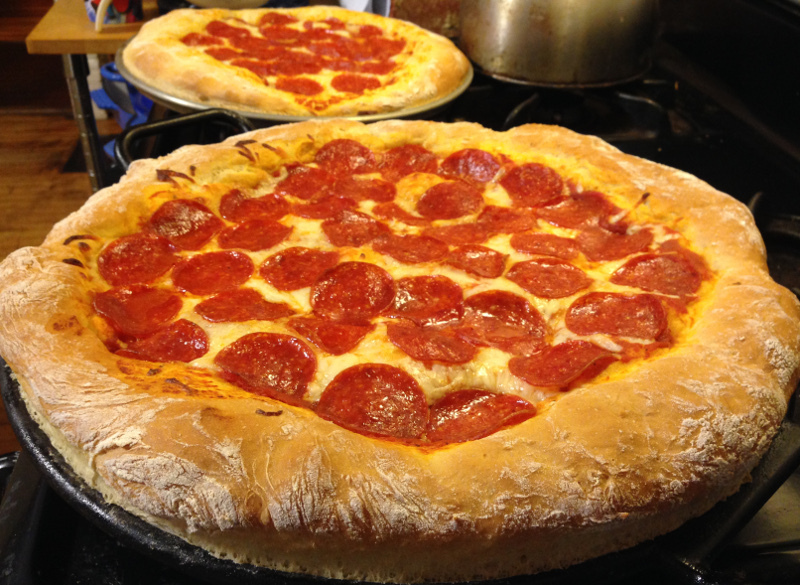 Most popular convenience foods and restaurant foods were inspired by their homemade counterparts. Ther secret to recreating these foods well is to go back to the original homemade versions. Many basic cookbooks have wonderful recipes for homemade sauces, breads, etc. There are some great cookbooks that strive to duplicate some of the more favorite purchased foods. One of the best is called “Top Secret Recipes” by Todd Wilbur. He has three books out with more in the works. Check out his website at: TopSecretRecipes . It’s excellent! Some other “clone” recipe websites: Copycat, etc. 10. Eat less meat– Does spaghetti really have to have all those meatballs? Does your pizza really have to have all of that meat on it? Only you will know for sure what your family will miss and what it won’t. Many other cultures use meat sparingly in their dishes. Check out Asian and Indian recipes in particular.And try to think of meat as an accent to the dinner rather than the main course. If this is too difficult, try cutting portion sizes of meats and adding more side dishes to compensate. There is always a way to cut down on meat consumption! 11. Stretch Meats-you may be able to get away with extending your meat by mixing in extra veggies, grains or even TVP (textured vegetable protein). TVP is made from soybeans and there are quite a few restaurants that use it, so it may be more familiar than you think! It comes in chunks or crumbled. It is dry and can be rehydrated before using or in the actual recipe you are using it in. you can hide it best in ground beef dishes, especially, dark ones, like chili. If TVP is not an option, stretch meats by cutting amounts in recipes and adding more beans, veggies, grains to the dish until your family complains, then ad back in a enough to make them happy. 12. Use your leftovers– Get a free meal by saving those leftovers! If you think you will forget about them, label them and freeze! On leftover night, have a smorgasbord. You can also create “party trays” with smidgeons of this and that arranged prettily. Restaurants offer these, why can’t you? 13. Pack your lunches– This is a great way to use up leftovers! It is our first choice. Lunches don’t have to be boring either. Think of items you might order at a deli and duplicate at home. I send the hubby and kids with homemade hoagies, pitas stuffed with tuna, BLTs, pigs in blankets, cold pizza (they love this),bologna burritos (just a bologna sandwich on a tortilla instead of bread), and homemade hot pockets. I always have them participate in the lunch decisions or in actually making the lunches. This helps stem complaints! I include nonmessy fruits like bananas, apples and grapes, dried fruit, trail mix, popcorn, chips and homemade goodies- cookies, pudding, rice krispy treats, etc. There are lots of great brown bag ideas for lunches on the Busy cooks website. 14. Take drinks with you-if you are working and spend money on coffee, buy a thermos and take your own. Take along water or tea in a big jug on outings, especially during the summer months. This will help you resist the temptation of stopping at a fast food joint and ordering an overpriced, undernourishing soda. Pack drinks for the kids if you pack their lunches. When I did the math with my price book, I found to my amazement that the half pints of milk from the subsidized milk program are much more expensive than sending milk I buy at the store! Here a half pint (1 cup) of milk at school costs 25 cents, but the milk I buy at Aldi is $1.79 a gallon, or 11 cents a cup! I can send my kids to school with twice as much milk and still save money! 15. Fill up on healthier foods – as you may have noticed from the selection of lunches above, I try to include healthy foods in the kids lunches. I try to offer fruits and popcorn as snacks, rather than junk food, I offer them water between meals with the occasional koolaid. I buy whole grain breads only and try to make mostly whole or half white/half whole grain baked goods. Any change is better than none. Whole grains and healthy foods fill you up and nourish you . You will eat less and crave less because your body is nourished more.Think of wholesome foods as an investment in your health. You may also find yourself visiting the doctor less often! Some suggestions for putting more healthy foods in your diet: try eating brown rice instead of white, wheat bread instead of white, offer water between meals instead of koolaid and soda (and try to actually drink 8 glasses of water daily), keep fruits on hand instead of candy and cookies, fix veggie trays ad dips for snacks instead of offering chips. These little changes, done daily can add up-to savings in money, loss of weight and better health! 16. Maintain a healthy weight– once you begin eating better and dropping some pounds, you will notice you tend to eat less. This saves money and your health! Not only that, if you maintain a comfortable weight, your clothes will fit (won’t have to buy bigger ones, not to mention all the great deals to be found at yard sales where people sell their “skinny” clothes) and you’ll feel better. You’ll have more energy to be frugal! 17. Substitute (or eliminate) expensive ingredients for cheaper ones– Does the recipe have to be made with the expensive item? Can a cheaper version be found and taste just as good? Can you eliminate the ingredient all together? I have found no taste difference between real vanilla extract and imitation. When we have a fancy Christmas get together and want to serve a seafood platter, we serve imitation crab instead of shrimp. It is cheaper, still tastes wonderful, and keeps for much longer than shrimp. If I buy the crab meat when Cub Foods deli is having a sale, I can get it for around 1.49 a pound (reg $2.50), that beats $8-$18 a pound for shrimp any day! The same can be said for many expensive ingredients :look for alternatives and substitutes. 18. Can’t substitute? Then cut down on expensive ingredients– If you just can’t live without that certain something in your recipe, try cutting the amount in half and see how it tastes. Keep cutting down the amount until the recipe starts to suffer, then add a little back in, until it tastes the way you like. You may be surprised at how little you actually need! 19. Grow it yourself– Still want to use bundles of fresh herbs in your famous pasta sauce but hate the price? Plant some! Herbs are so easy to grow and so useful. Many are perennial: sage, oregano, lavender (yes you can use it in cooking), mint, lemon balm, chives, the list is extensive! Biannuals will reseed themselves if you let them go to seed, these include: basil, parsley, dill, nasturtium, pansies (great in salads as decoration). Even saffron ($16 a pound!) can be grown at home! Saffron comes from the saffron crocus, a bulb plant, which blooms in fall. Plant some in the spring and you will have one of the world’s most expensive seasonings at your fingertips for very little money. 20. Gardening-Growing a few herbs may give you the courage to grow a full-fledged vegetable garden. Or you may want to try edible landscaping – putting plants in your landscape that give you food too, like fruit trees, berry bushes, etc. The best books I have read on gardening come from Elliot Coleman. He is a market gardener who grows food organically. He hosts a tv show on The Learning Channel called “Gardening Naturally”. Check out books from the library, read a few gardening magazines and pick some gardening friends’ brains. The most important advice: have fun and grow food that you actually eat. I have grown a few “cool” foods that went to waste because the family wouldn’t eat them and I didn’t know what to do with them! There are many cookbooks on using garden harvests, so check those out too. Many are arranged seasonally so you can take advantage of what is fresh and abundant (even if you don’t garden, these are handy!) One of my favorites is “The Victory Garden Cookbook” by Marian Morash. I got it at a yardsale for a quarter! 21. Canning and Drying-As you become more accomplished both in cooking and gardening, you may want to can those special sauces, pickles, and jellies for even more savings. There are many excellent food preserving books in the library and bookstores. Here are some online resources, if you do a websearch, you will find even more! Don’t have time to can or is it too hot? You can freeze some things, like berries, to make into jellies and sauces later on, when the weather is cooler and you have more time. 22. Shop Alternative sources for food– get creative and keep your eyes open! Check out the farmer’s markets, food co-ops, farm co-ops, undamaged freight stores, restaurant and baking supply companies, wholesalers, roadside stands, health food stores,etc. Don’t forget to ask about grocery store “seconds” those foods that may be slightly damaged and not quite perfect enough to sell at full price. Check out grower’s seconds, as well as drops from fruit orchards. There are always cheaper alternatives, just keep looking and asking. 23. Buy and use in season veggies and fruit-they are usually fresher and cheaper. When tomatoes are in season, make lots of tomato sauce and can it, and plant to eat lots of BLTs. Enjoy God’s bounty! Make strawberry shortcake when strawberries are at their best and cheapest, usually in June and July. Cook with more root vegetables in winter, when they are at their best and summer veggies are out of season. Check out seasonal cookbooks at the library for more ideas. 24. Learn the sales pattern-this is best done using your price book. Not only are there better seasons to buy some veggies than others, but meats and other food staples tend to go on sale according to season, holiday, and what store you are shopping at. Hams are usually on sale around Easter and Thanksgiving, turkeys are always on sale in November and December, but sometimes they are even lower at other times of the year! So learn the sales patterns of your favorite stores and stock up! 25. Try store brand and generic-as with substituting cheaper things for the expensive, try lower cost items. Keep going down in price until you notice a change in the quality, then move back to the next brand/item up. You may discover that most brands are created equal and some generics are pretty good too! Some basics, like sugar and flour, really don’t change from brand to brand, so go with the lowest price and/or what is on sale. 26. Use coupons and rebates occasionally– I only use coupons and rebates if I like and buy the item regularly, and I can’t get the item at a lower price by using store/generic brands. Sam’s club sometimes has some very good refunds on items I use, such as disposable diapers (theirs are cheaper than most stores and good quality). Another refund I look forward to are the underwear refunds around back to school time. Usually there are coupons and refunds for the undies at the same time! So use discretion, don’t go nuts on coupons and rebates. Your price book will be a great help in determining whether a coupon is a good deal or not. 27. 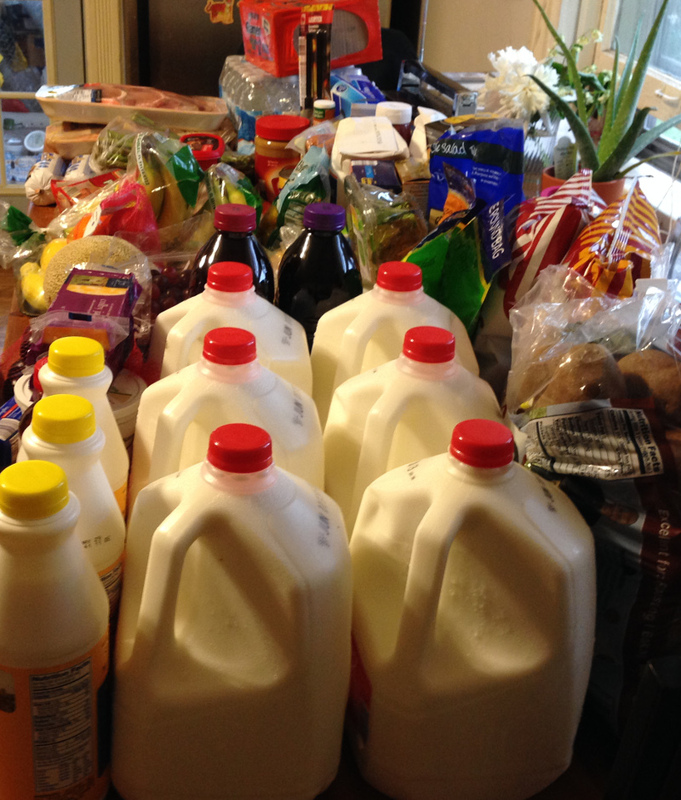 Free Food Sources-yes, there is such a thing as free food! Here in Illinois, we go mushrooming in the spring at my mother in laws’ farm. We pick bags and bags of morelles (store price: $16 a pound!!)! We also go berry picking. The trick to any kind of wild food foraging is that you absolutely MUST know what you are picking, no guessing! Free food is not worth it if it makes you sick or poisons you! Some other alternatives: extra produce from relatives’, friends’ neighbors’ gardens, fruit trees in your yard, or picked from with permission if they are in someone else’s yard. You may be surprised at what you get if you just ask! Check out the WIC program if you are pregnant, nursing or have kids under 5, this is an excellent source of free foods (milk, juice, eggs, cereal, peanut butter) for those who need it most. Also check out local charity programs, such as “ShareFood”, where you do a little bit of work and get a bag of groceries for $13. There are no income restrictions and the food varies, but some of my friends have tried it and liked it very much, especially the volunteer work! Also consider bartering! Perhaps you could mow your elderly neighbor’s lawn in exchange for a bushel of apples. Get creative! 28. Menu Planning– this is a good one to remember! 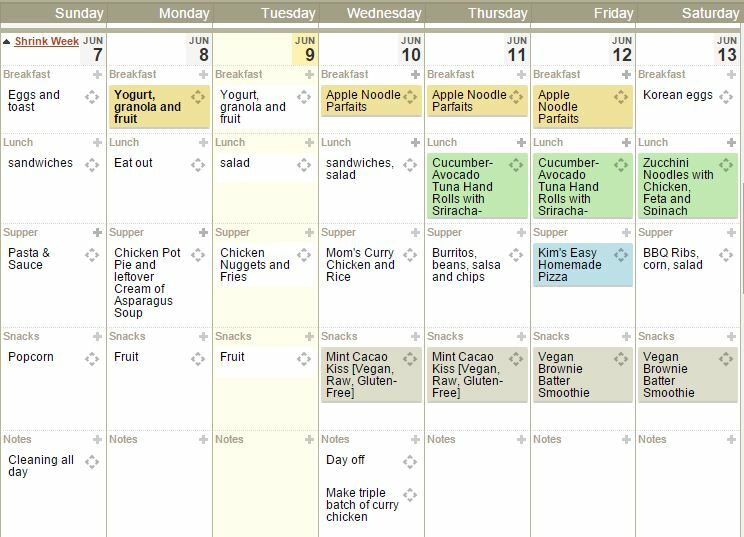 Build your meal plans around: A) what you already have and B) what is on sale. You could also plan around what is in your garden and in season locally. 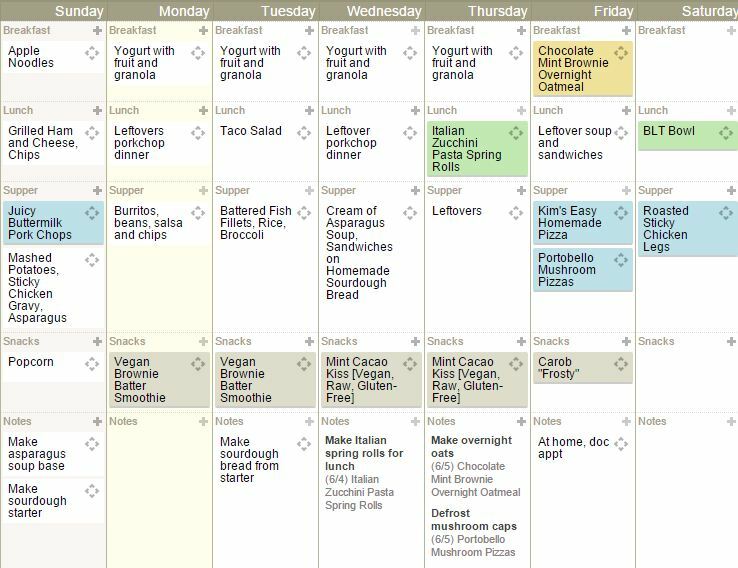 Use all of the methods here to plan a loosely constructed menu plan. I like to have a menu plan when I do OAMC. I gather the recipes, gather what I need, and cook away! I try to think of many different ways to use what I have so I won’t spend too much. But I can’t seem to keep to a strict menu. We eat everything I cook and improvise with leftovers. So try it out, but be flexible! 29. Once a month cooking-ok, it doesn’t have to be once a month, it could be once a week or twice a month, or just bulk cooking. The secret is to make every cooking count! This way you are not only saving money, but time as well! Check out my getting started page (not posted yet! Under construction!) for more info on this method of cooking. 30. Keep it simple– you don’t have to give up gourmet foods, but keep your daily meals simple. Don’t feel like you have to make “five-star” restaurant meals every night! Make them special! Here in the Midwest, the cuisine is very simple, much to my dismay (I LOVE gourmet foods!). I find my husband and kids are happiest when I make the simple, humble meals, instead of fancy spreads, and I find that I am more relaxed! I compromise by making up some wonderful, gourmet foods for myself, freezing the dishes in one person portions and eating them at lunch. I can have all my favorites and no one turns their nose up! The best of both worlds! This entry was posted in Basics, Budgeting, Vintage.